I know it’s not summer but, this is actually the time that most designers and merchandisers start working on there summer line up, whether it be brochure designs or website designs or textile designs. 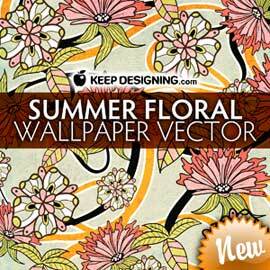 This floral vector wallpaper pattern is an original, copyright free artwork that can be used on any commercial or personal project. This eps file is friendly to anyone using adobe illustrator 8 or higher. Make us proud and use this vector on you next masterpiece. Thanks for checking us out, more coming soon. Please check out our vector textures, we’ve got some freebies as well! great, great,great, great.. beautiful patterns, keep it up! love this! thank you so much for sharing so generously! happy new year! This vectors are really good and very pretty. Thanks a lot…..
All I can say is WOW! I am so excited about your vectors. Thank you so much for sharing your talent. Would you mind if I placed a link to your site on my blog http://justbecauseimages.wordpress.com? Thanks again! Hi Kasia, you’re welcome. We would love it if you would place a link! I like your work, particularly the glowlights photo – cool and evocative. 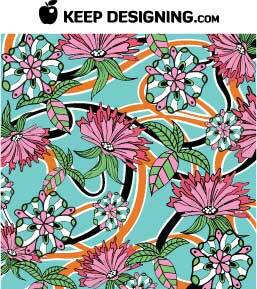 I LOVE this summer wallpaper and would LOVE to use it for my daughters luau invitation, BUT am blocked from the website you have it available to download. Any chance you can email it to me??? really pretty! how do i get the other colour option? Hi Carli, sorry for the late response. You can freely use the graphic as you describe. No purchase necessary. Nice article again. I enjoy being a longtime subscriber on your website Super! i are going to eventually exchange the home page using your website. I won’t be able to thank you enough for the posts on your web site. I know you place a lot of time and energy into them and really hope you know how much I appreciate it. I hope I can do a similar thing for another person one of these days. thank you so much for sharing! I was wondering if i can use this pattern for a commercial use? Can i print it? Hi Tim, yes you can use commercially as you describe. These are just lovely!! Just understanding vector design. Thank you very much for your talent and generosity in sharing. The Lean And The Plenty release a free song download, the sobering Midwestern coal mining tale Black Mountain Blues. The best way to improve yourself as a graphic designer is to keep designing. Here you'll find free vector art graphics, tutorials, brushes, photos, tips and techniques to make the most of your creative journey. Big thanks to everyone for such great responses to our free vector art.